students. We also ask parents to participate in this endeavor by reading and posting our "Children's Home Rules" at home and keeping track of their children's good behavior with a citizenship chart that every child receives. 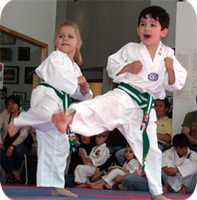 For us Taekwon-Do is not just athletics or kicking and punching. It is a martial art that seeks to develop character and cultivate both the mind and body of the practitioner. It is with this discipline and focus that we teach our students. Our primary objective is to teach kids how to listen, focus and achieve self-discipline and confidence through Taekwon-Do practice. The physical practice of Taekwon-Do will improve strength, fitness and coordination, while the mental practice of Taekwon-Do will teach respect, kindness, courage, leadership and other valuable life lessons. The head instructor of every class is an internationally certified black belt (usually 2nd degree and higher), who has been personally taught by Grandmaster Kim. They are often assisted by other of Grandmaster Kim's students. The teacher to student ratio is around 1 to 5. What is expected of our students? We emphasize effort and sincerity of practice in our classes. We expect children to listen well, learn and try their best at all times.